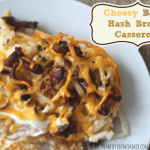 This easy, cheesy hash brown casserole is quick to prepare and tastes good for breakfast and its hearty enough for dinner! Can I tell you something? I was actually a vegetarian for a while growing up…even when I started eating meat again in college I didn’t eat much of it, in fact, I didn’t know how to cook meat at all other than hamburger helper! When I met my husband I quickly realized I was dealing with a quintessential “Meat and Potatoes” kind of guy. I had my mom give me some quick lessons on cooking steaks and some favorite recipes and now ten years later I can hang with the best of them. 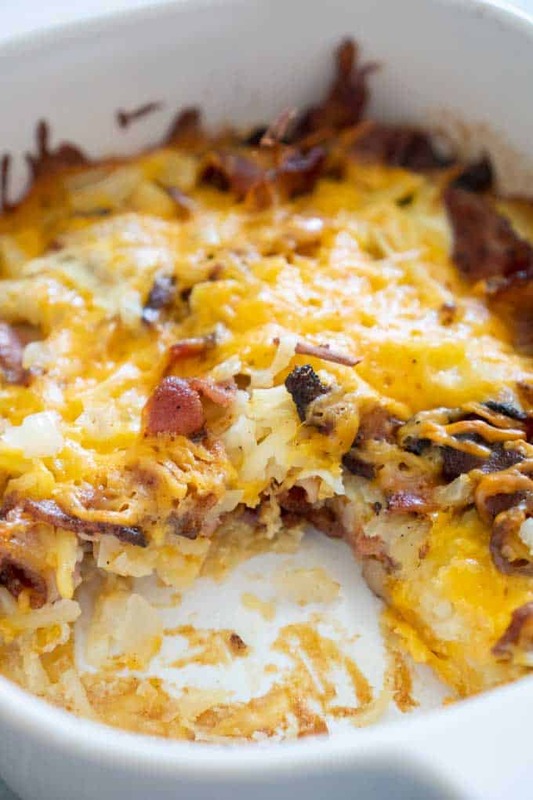 One of my favorite breakfasts to make for my husband and three boys who are following his eating habits is this Cheesy Hash Brown Casserole. Not only is it easy to prep but it tastes amazing-it’s one of my go-to recipes for holidays like Christmas or Father’s Day! I hope you enjoy it as much as my brood does-I’d love to hear your thoughts in the comments section! Layer one half each of potatoes, bacon, cheese, and onion in dish. Combine egg, evaporated milk, and seasoning salt in bowl and mix until well blended. Pour mixture over casserole and cover with foil. Bake for one hour, remove foil and bake and additional 5 minutes. YUM!! 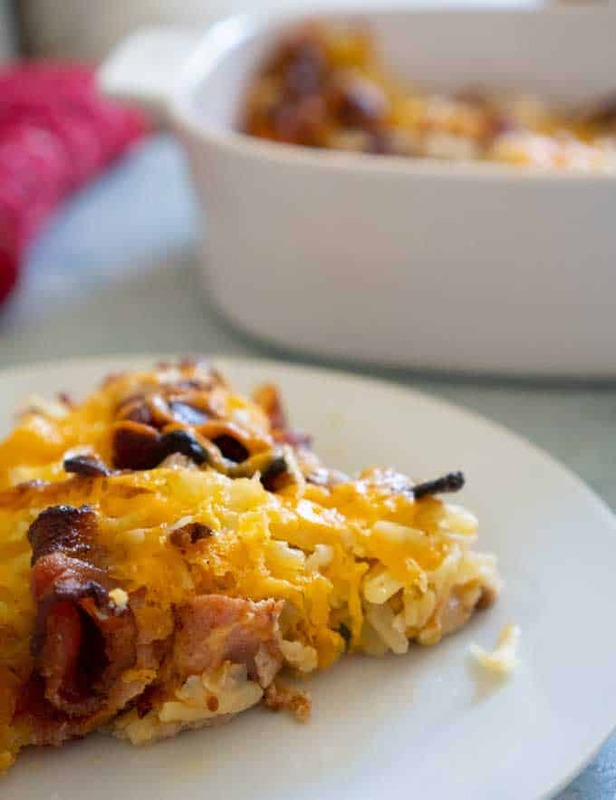 We make a cheesy hashbrown casserole, but I love the bacon and evaporated milk. Can’t wait to make this! Oh my gosh this looks amazing! JM would LOVE this! 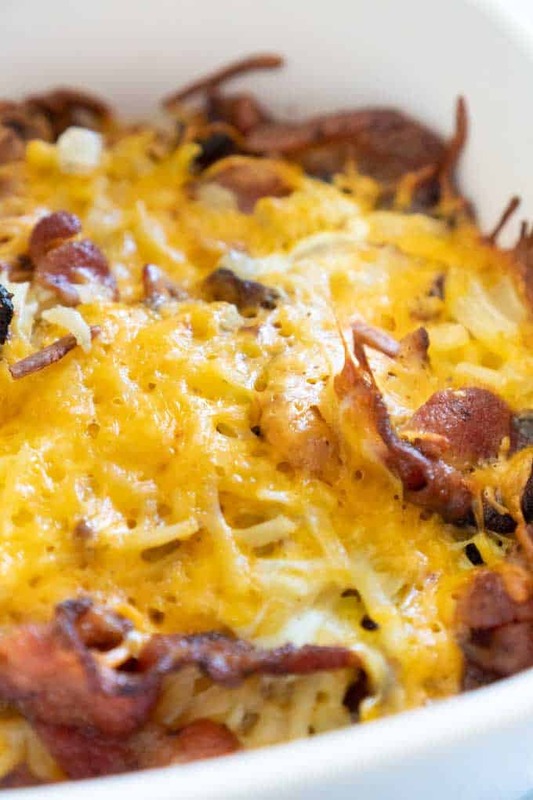 This would be a perfect make ahead casserole! Thanks Sorry I meant just one egg not “gift”. Typing too late at night! Making this for Father’s Day. Thanks Jenn! It didn’t last long with my husband and boys! You did not include the bacon in the directions. Assume they get mixed with the potato, onion, & cheese mixture? Thank you for catching that Penny, yes, the bacon is layered w/ the potatoes, etc. I’ve update the recipe as well. Assuming bacon is layered with everything else??? Yes! So sorry! I’ve fixed the recipe now! Thanks for responding so soon!!! I have a couple of old recipes I always have to go over a couple of times because I didn’t write the directions down verbatim!!! Love your site!!! Best ever! this is my famiky’s new favorite meal, my husband requests it almost weekly, thank you!! I LOVE this recipe, been making it for years since you very first published it and it is my husband’s favorite. Thank you!